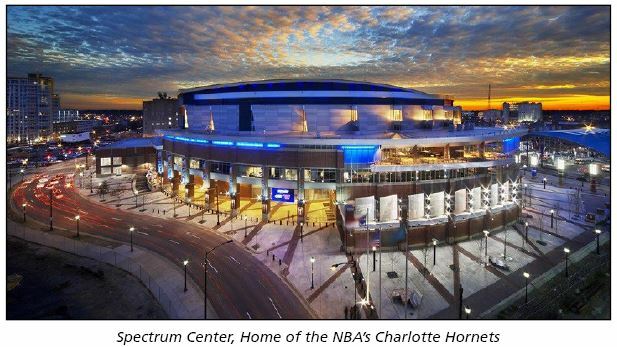 As part of an ongoing effort to highlight dedicated and passionate organics recycling and diversion programs across the country, Natur-Blog spoke to the team heading up the recycling program at Charlotte, NC's Spectrum Center, home of the Charlotte Hornets. This is a summary of how their program was founded and the success they've seen since its inception. With tens of millions of viewers tuning in each night to watch their favorite National Basketball Association (NBA) teams, it’s becoming increasingly vital for these teams and their homes to be cognizant of the power they yield when making a difference in the world, especially with so much emphasis being placed on the environment and sustainability in recent years. The Charlotte Hornets were fully aware of this responsibility when in early 2015 they began talks with the Charlotte Regional Visitors Authority (CRVA) and the city of Charlotte to develop and install a comprehensive recycling plan. As organics recycling and composting was nonexistent at Spectrum Center at the time, the only way was up. This wasn’t going to be an overnight success and there were no such expectations, but Spectrum Center and CRVA staff aimed to be part of one of the most sustainable organizations in the NBA and it was clear that the time was right to launch such a program. Upon the program’s inception, the primary focus immediately turned to recycling as the platform to build on. First efforts were largely shaped thanks to a collaboration with Waste Management, who assisted Spectrum Center and CRVA staff in forming their program by providing them with a waste characterization study which analyzed Spectrum Center’s waste generation and collection efforts over a six-month period. Contamination is always a concern as it relates to recycling. Not only does it affect the quality of the materials captured, it will add downstream process burdens that result in increased costs. 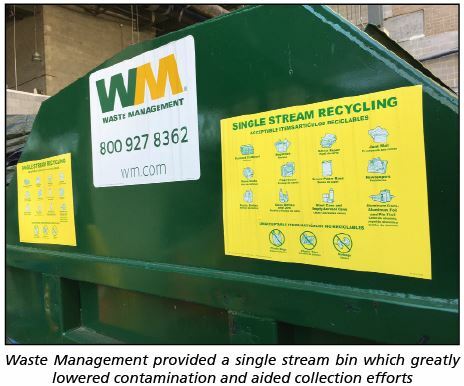 In an effort to help address this concern, Waste Management provided Spectrum Center with a specialty single stream waste bin which was instrumental in reducing contamination while aiding collection efforts. Because of this bin and dedicated inspection of bins and bags, contamination has been contained to a minimum since the program began. With the help of the waste characterization study, over the next six months Spectrum Center began to work with vendors and service providers such as Jani-King, SupplyWorks, Levy Restaurants, Earth Farms, and the aforementioned Waste Management to develop the steps needed to meet the NBA’s blossoming "green" movement. Regularly scheduled internal meetings which involved various stakeholders were vital, as was constant feedback from all of those involved. These meetings helped shape the future of the program on a real-time basis while identifying opportunities for growth. Out of these partnerships came a system where separate vendors pick up food scraps, corrugate, grease, shredded paper, and pallets, while Waste Management serves as the aluminum and polyethylene terephthalate (PET) plastics hauler. Though there are many challenges to work around and overcome, having strong partnerships is essential with the goal of achieving a robust recycling program with maximum buy-in from all involved. As it relates to food scraps, Spectrum Center collected 8.25 tons of food scraps in 2016, up from 1.75 tons in 2015, a 471% increase! When it comes to instituting any recycling program, one of the biggest hurdles often encountered is the attitude shift required from employees to devote more time, energy, and awareness to how and where they discard their waste. Luckily Spectrum Center, an all-in approach was encouraged and adopted from all levels within the organization, including their vendor partners. 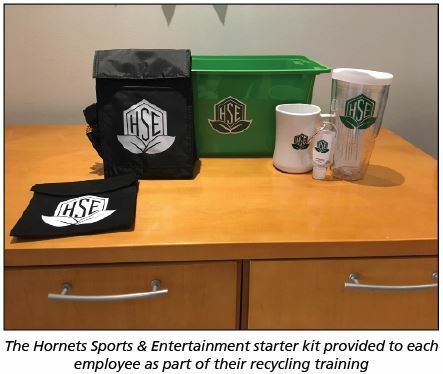 To help drive awareness to these programs, each employee was provided a “starter’s kit” which, among other items, includes educational material on the arena’s recycling and food scrap collection efforts. In addition to employee and staff training, it was essential to foster an attitude shift and buy-in. 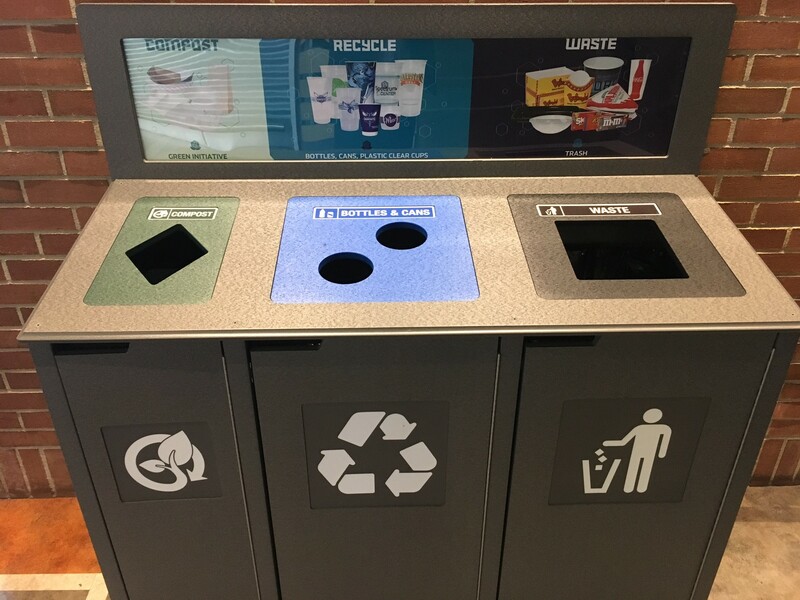 Spectrum Center worked with their vendor partners to make recycling as easy as possible, from color-coded signage developed from a list of everything sold to guests by the vendors, to recycling bins being placed directly next to pour stations in order to streamline the recycling process. As the recycling program started to pick up, Spectrum Center and CRVA staff looked to expand their recycling program to include food scrap collection. Their initial focus centered capturing food scraps generated at the main kitchens and commissaries such as the FrontCourt Kitchen. Just like with recycling, the kitchen staff was trained on how to properly dispose of food scraps. In addition to training, the staff had to deal with the “yuck” factor associated with food scrap collection. 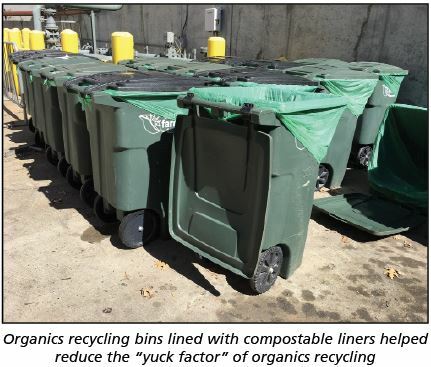 The yuck factor was addressed with compostable liners as they helped minimize the odor, leakage, and costs associated with cleaning the food scrap collection bins provided by Earth Farms. These scraps are then collected 2-3 times a week by Earth Farms as part of their contract to collect and process the scraps and compostable liners at their composting facility. The next stage of their food scrap collection program saw Spectrum Center expand their focus on the general concourse. 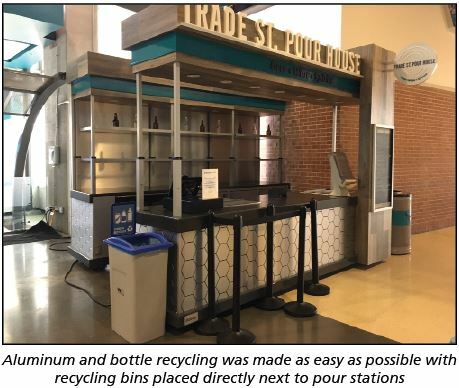 As it relates to front of the house and fan engagement, Spectrum Center staff knew they had to make it as easy as possible for fans and guests to participate in the recycling program. Working with various vendors, Spectrum Center installed 16 Max-R stations throughout the general concourse. Each sort station had a dedicated bin for food scraps, recycling, and landfill which were clearly identified by effective messaging consistent with color coding and clear imaging of food service packaging. These stations were used throughout the arena, thus driving awareness and reducing contamination and sort anxiety. Did you know: It’s estimated you have less than two seconds of someone’s attention before they throw everything away in one bin. This creates contamination and drives up costs. Make it simple and easy with effective sort stations and sort signs! As far as what the future holds, the way forward is clear in that continuous improvement is the primary goal. This includes expanding the recycling and food scrap collection in suites and break rooms, using compostable packaging in combination with durable-ware, increased use of signage, and continuing education for employees and visitors to the venue. Fan engagement is also vital as proper waste disposal often begins with visitors to the arena. Initial discussions have been had regarding public service announcements, mascot interaction with the fans, educational videos and so much more to reach the goals the Spectrum Center team has set for itself. Despite the tangible accomplishments, perhaps the most encouraging byproduct of this program has been the complete buy-in from the top of the organization all the way to the bottom, from the board room to the haulers to arena guests. 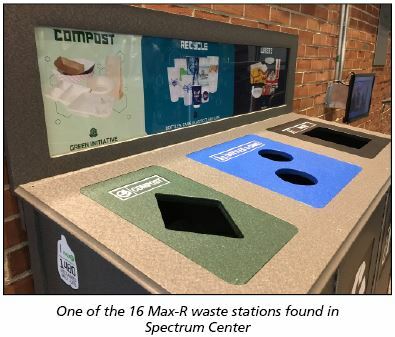 Reporting the program’s success is vital in developing further enthusiasm from staff and visitors, an enthusiasm for recycling which is at an all-time high at Spectrum Center. Passion for the commitment to sustainability permeates Spectrum Center and they’ve received much positive feedback for their work, work which is still to see its best days to come. This effort would not be possible without the hard work and collaborative efforts from Spectrum Center General Manager Donna Julian, Spectrum Center Manager of Arena & Event Operations Alex MacKenzie, CRVA Director of Support Services for Spectrum Center Bill Becker, CRVA Operations Coordinator for Spectrum Center Ashley Gladney and Bojangles’ Coliseum and Ovens Auditorium General Manager Cathy Buchhofer. A special thank you to them and their team. Natur-Bag would like to wish all involved in this program success as they move forward in their recycling and food scrap collection journey. For more information on the green movement and sustainability and recycling efforts in the world of sports, please visit the Green Sports Alliance website. ©2010-2016 Natur-Bag® All Rights Reserved.